What changes after the decision? Could the administration modify the list of banned countries? Answers to those questions and more. 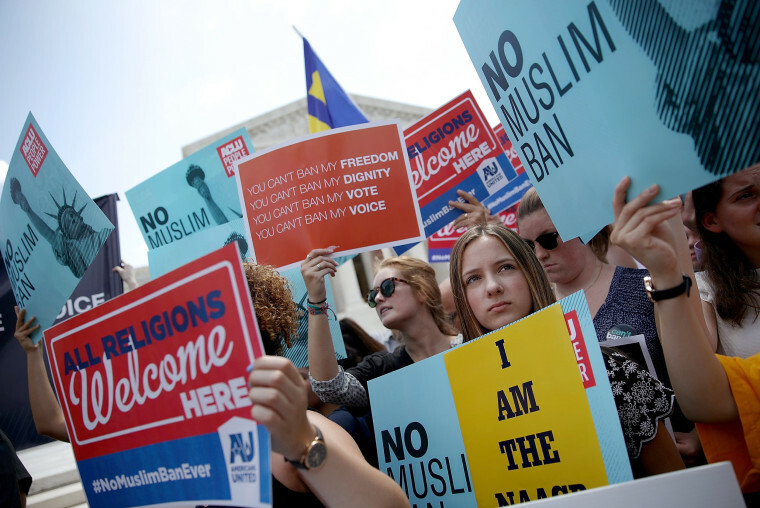 WASHINGTON — The U.S. Supreme Court, in a 5-4 ruling, upheld President Donald Trump's restriction on travel to the United States from a handful of Muslim countries on Tuesday, giving the White House its first high court victory on the merits of a presidential initiative. 1. What changes after the decision? As a practical matter, nothing. Although a judge in Hawaii ordered the government last fall not to enforce the latest travel ban, the Supreme Court lifted that order in December, and the restrictions have been in place since then. The ruling Tuesday lifts that uncertainty and clears the way for continued enforcement. 2. What countries are covered? The heart of the travel ban puts restrictions on people who want to come to the U.S. from Iran, Libya, Syria, Somalia and Yemen. It also bars most travel from North Korea, although few visas were issued to people from there anyway. And it limits travel to the U.S. by certain government officials from Venezuela but otherwise doesn't apply there. 3. Could the admin change the list? It already has. Since the original restriction was announced last September, the government removed Chad from the list, concluding that its system for evaluating visa applicants had improved enough to meet U.S. standards. Iraq was covered by earlier versions of the travel ban, but the administration removed it, citing its close cooperation in fighting ISIS. There's nothing in the Supreme Court ruling that would prevent the administration from adding a country to the list if it fell below the standards for cooperating with the U.S. in providing information about potential travelers. 4. Did Trump's tweets matter? The challengers to the travel ban said the president's statements about Muslims during the campaign and his repeated tweets on the subject show that the policy discriminated on the basis of religion. Justice Sonia Sotomayor, writing the dissent, said they show that the travel ban was motivated by animosity toward a disfavored group. But in his option for the majority, Chief Justice John Roberts said the court's job wasn't to decide whether to denounce those statements. The court concluded that because the president acted within the core of his responsibility, he clearly had the authority to impose the travel ban. The court said that the ban is "facially neutral toward religion," and that the Trump's statements don't change that fact. 5. What happens to the case now? Tuesday's Supreme Court ruling resolved one question, whether the Hawaii judge's order to block enforcement should go back into effect or be overturned, and the justices threw the order out. Under normal circumstances after such a decision, the case would go back to Hawaii for a trial on the underlying merits of the case. But that seems unlikely, because Tuesday's decision leaves the challengers almost no ground to stand on. Even so, the challengers say their lawsuits against the Trump administration forced the White House to narrow the travel ban.